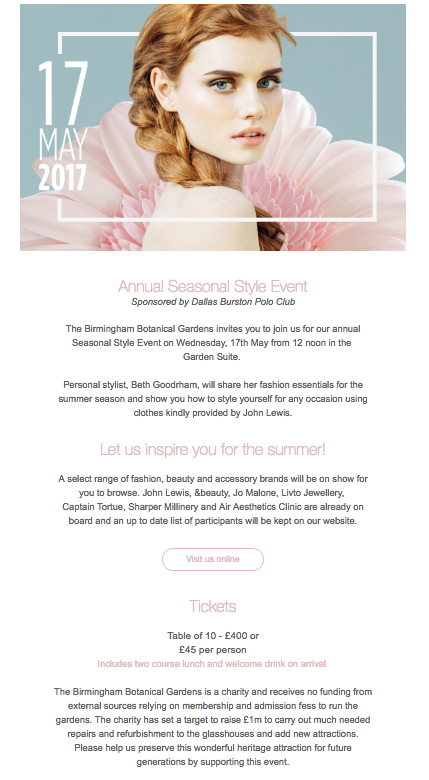 I just briefly wanted to mention to you the event that I'm styling and presenting at the Botanical Gardens in Birmingham on 17th May. It's a lunchtime event with a fizz reception and a gorgeous sit down meal. I have four amazing models modelling for me and I will be styling outfits for events from Ascot to a Summer Wedding and the from a trip to the Polo, through to the Tennis and a Festival - with clothes kindly being provided by John Lewis. This is the third year that we've held the event and we have Jo Malone coming along, together with Marc Jacobs make-up and jewellery by local brand Livto, as well as Stella & Dot. Tickets for the event are £45 each or £400 for a table of ten and can be bought via the Botanical Gardens website here The event is a really fabulous afternoon out and it would be great to see some of you there. Gift Pop Boutique - for all things tasselled, sparkly and neon! Sorry to those of you who have already seen this post. I published it a while ago and then it seemed to "in-publish" itself...so here it is again! 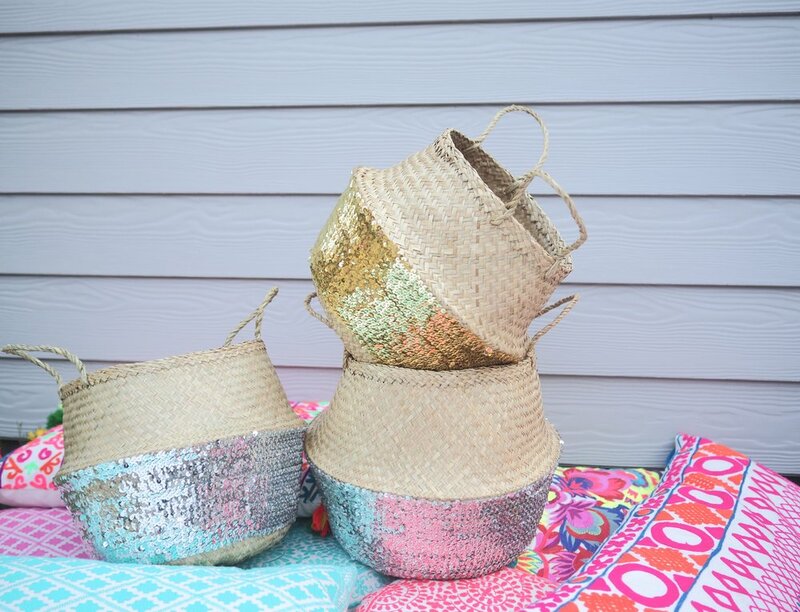 Hannah had a desire to set up something that was fun and colourful, so she took the plunge and put together a small collection of bright, happy and wonderful things, vibrant things that she would like to buy for herself, or her family and friends. Everything she chooses is meant to be exciting, individual and affordable and with an abundance of sequins, hearts, tassels, pom poms and neon, she doesn't fail to disappoint. I adore this "Happy" basket, which I used today when I went to the beauticians to have my legs sprayed a less bluer shade of blue. The sun was shining and in it I popped my flip-flops, my keys and my purse. Equally it would be great to use around the house, disguising those bits and bobs that get in the way but which are a necessary part of life. A bit like children really. Only joking - I mean keys, lipsticks and bits of lego. 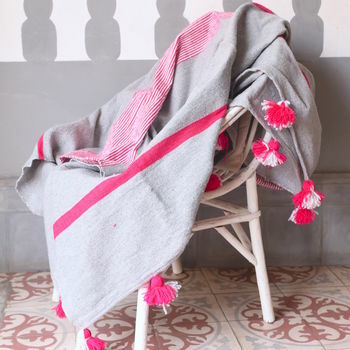 Next on my list is one of these Gift pop throws (£85) which is just what our living room needs now that the warmer months are (hopefully) here. It's time to store away the faux fur and embrace the pom poms instead! It wasn't until a few seasons ago that I had a white blazer. I really wasn't sure whether I would get the wear out of it and I wondered whether I might trash it really quickly. So, I bought an inexpensive one from Zara to test the water on the basis that if it earned its way, I might invest in one further down the line. And then I found that I wore it A LOT. It just gave a lift to my summer wardrobe and it felt fresher than my usual navy or black. 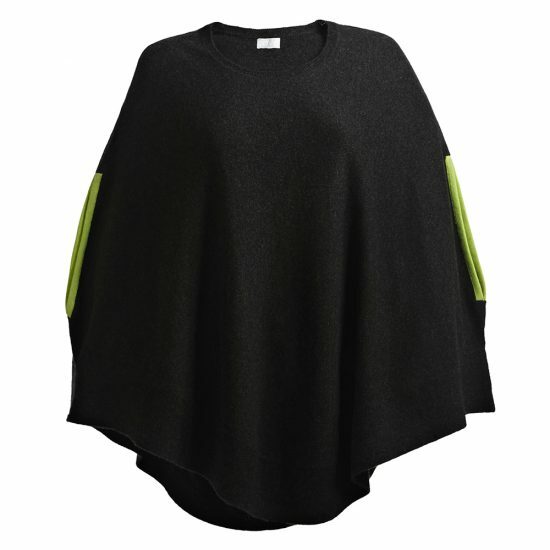 And I found it surprisingly versatile - with jeans, pleather leggings, dresses, for a night out and to a wedding (thankfully saving me from pastel pashminas) - and it made me feel pulled together. 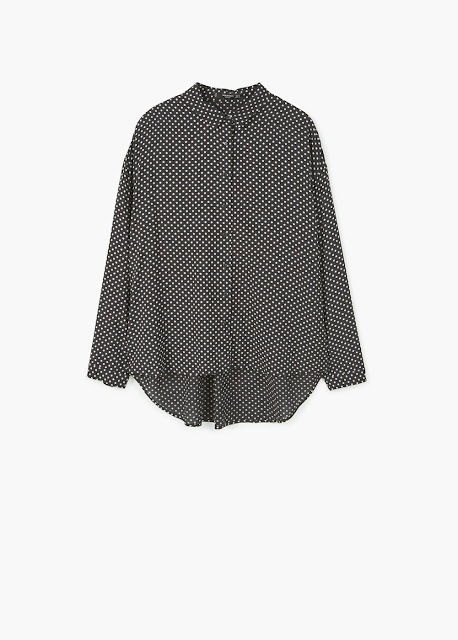 That was a while ago now, so when the chance came along for me to select a few pieces from the current Baukjen collection to style, unsurprisingly their Lexden blazer (£199) jumped out at me. I really wanted to see what the fit was like, as well as whether it felt any different to my considerably less expensive Zara one. The good thing about this white blazer (and what I should have checked, and failed to do so when buying my Zara blazer) is that it is machine washable at 30 degrees. 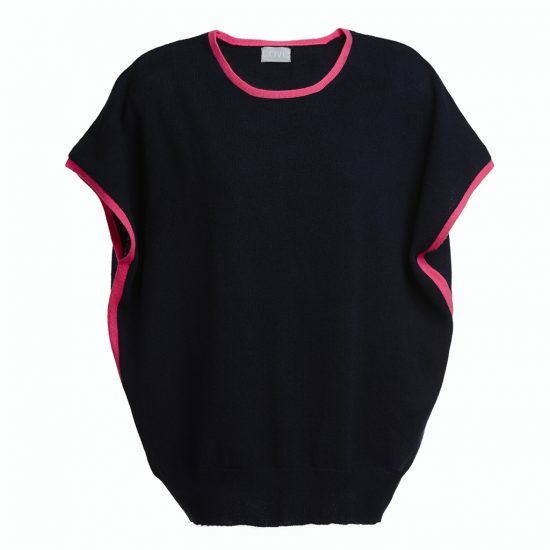 It is a soft ponte jersey fabric which is comprised of 70% viscose, 25% polyamide and 5% elastane. Whilst I used to think of viscose as some horrid fabric (wait for the nerdy comment) it is in fact structurally similar to cotton, being produced from a variety of plants such as soy, bamboo and sugar cane. So there you go! The reviews of this blazer online are really good and I can vouch for its fit and comfort. True, I didn't keep it on for long (I didn't want to enter dangerous Ribena territory) but because it's made from ponte it isn't stiff and boardy. It's a neat shape without being too fitted (no doubt the elastane helps with this) and I found the length of both the jacket and the sleeves to be good on me - I'm wearing a size 8 so it's true to size. Whilst it clearly is not the cheapest of blazers, it's such a classic style that it won't date. My only observation is that there wouldn't be a lot of room in the sleeve width to get much by way of another layer underneath it. But that could just be particular to me as someone who always thinks about how many layers they can squidge under something else. As with all of these things, it's just a matter of trying them and seeing how they work for you. 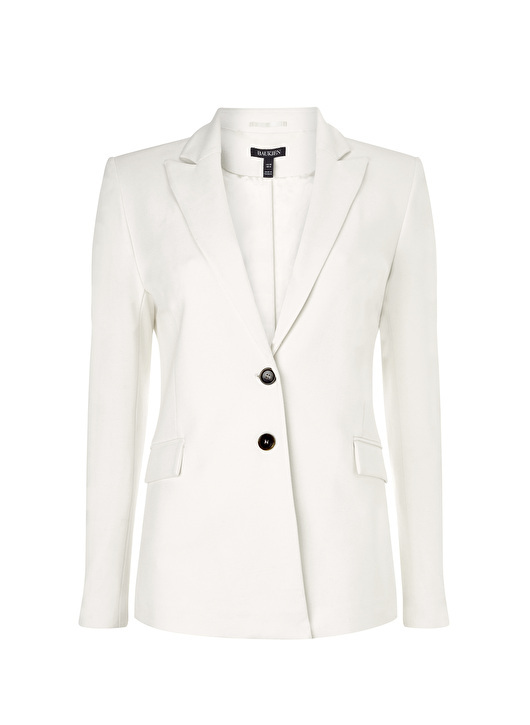 But if you're on the hunt for a new white blazer, of if you weren't but this one piques your interest, it could be a real wardrobe gem. Now I'm just warning you in advance - there are some scary and slightly too close for comfort photos coming up. Let's just focus on the jewellery shall we and not the wrinkles? I took these photos after a recent Friday night out to celebrate Mr SG's upcoming 50th. Say no more! We all know that there's a huge trend for huge ear-rings this season and whilst they are fabulous, as I've said before, I do feel a bit Pat Butcher in them. I'd love not to - but I do and there's nothing that I can do about it. But I do love ear piercings and pretty ear adornments. I went and had a good look at Maria Tash in Liberty when I was last in London as she has some beautiful ear-rings and her piercings are like works of art. However with each piercing being over £100 - and without a lot of spare room in my right ear to have any more piercings, I moved away from the idea. Having said that I still fancied some slightly edgier jewellery. Something a bit more "rock chic" than I might have had previously. 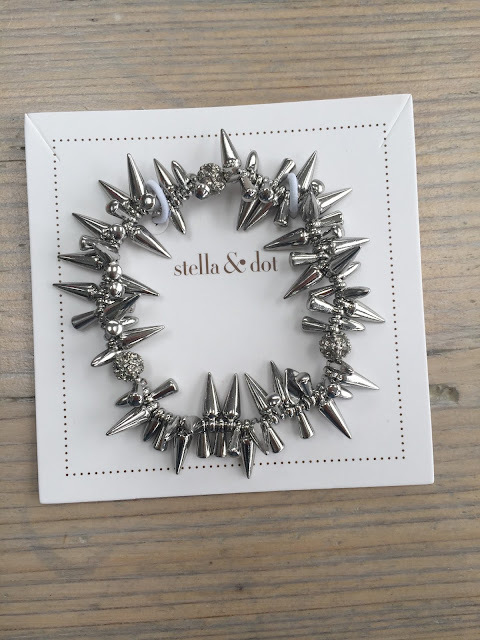 So when I was invited to a Stella & Dot jewellery party, I knew that I would be in luck. As we were heading off for the weekend, my decisions were quick! I started with the Pave triangle ear climber (£32). For a ring, I opted for the winding arrow ring (£25) which I wear on my thumb. It's a S/M and it can be made smaller, which is really handy as I have quite small fingers. The bracelets that I'm wearing are ones that I love and that I wear every day. They are from Bella Jane jewellery and they were gifted to me by Annabel a long time ago now. I love bracelets layered up together and these are just so easy to wear as they go with everything. So to add to my collection I bought the Renegade Cluster Bracelet (£45) from Stella & Dot - which is a spiky little number. If I put it around my neck I could do my best punk impression. As we get older and things soften around the edges soften - I'm thinking jawline, waistline, cheekbones etc - it's nice to counteract it with a bit of something slightly more angular! Or if you just fancy a change and a move away from more traditional pretty style jewellery, this could be an option - still delicate but just a little more edgy and it feels fresh too. I should just qualify the assertion that these are the "perfect" boyfriend jeans, because of course we all come different shapes and sizes. Some of us go in more at the waist than others, others of us have curvier hips, or slimmer , or longer, or shorter legs. BUT in so far as I have tried on lots of pairs of boyfriend jeans over the years, these are without a doubt, the best fit. Oh and the eagle eyed amongst you will notice that I am wearing the flowy shirt from Mango (£19.99) that I wrote about yesterday. I'm a bit like that when I get something new - I wear it with everything so as to bed it in and to see how it will work with my other bits and bobs in my wardrobe. These boyfriend jean from Baukjen (£99) come in five colours with these, which are off white, the washed indigo and the black wash, being 97% cotton and 3% elastane. The soft blue and soft pink have a slightly different composition of 98% cotton and 2% elastane - which if you're a jeans expert is all highly relevant. And because the soft blue and soft pink have less elastane in them, it is recommended to go up a size in these two shades. I like the versatility of boyfriend jeans. I love them for a night out with heels and a blazer - and here I've gone for more of a monochrome look but equally they are great in the day time with a slogan T and a biker jacket, or with the whole neon/tassel/pom pom look that I love for the summer. In terms of sizing, I'm wearing the 25" which is equivalent to an 8 and I could possibly go down to the 23" which would be a 6 - but I think that they would then lose their "slouch" which is the great thing about them. Lots of boyfriend jeans just don't have that element of slouch and tapering which is so crucial to the boyfriend fit. And when supposed boyfriend jeans just look like skinny ones when you try them on, it's beyond demoralising. I like that these come in so many different colours too. Lighter colours aren't practical for everyone's lifestyle and also the darker ones may be more flattering for some, so at least there's that element of choice. And whilst generally I'm not one for more expensive jeans (£40 or less is normally my price bracket) I always say to my clients that if you're someone who wears jeans a lot, and if you're looking for the perfect shape (whatever that shape may be), it's better to pay that bit more to secure the right ones. Hello everyone! I hope that you are having a fabulous Easter! Yesterday I did the quickest of whizzes into Birmingham with the three children for visits variously to H&M, Topshop and GAP (them) and to Mango (me!) where I bought this Flowy shirt (£19.99). I first saw it a few weeks ago and have pondered over it ever since. 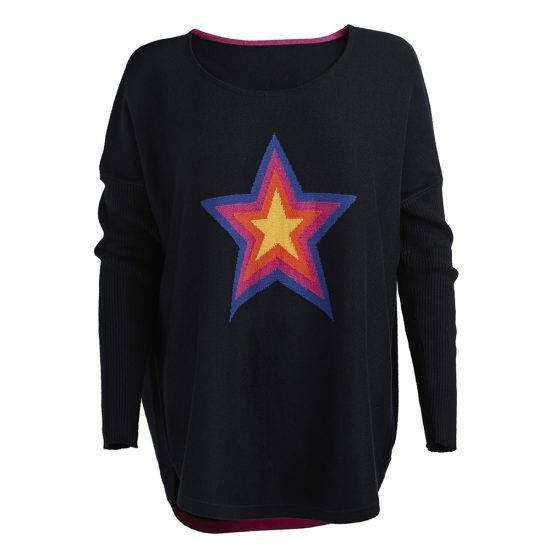 I have a real thing about stars at the moment (you may have seen me wearing my star jeans ALOT on Instagram pic and link below). Anyway, the shirt was a winner for a night out last night as I don't really have any longer tops, other than jumper dresses, to go with my pleather leggings and as we were going out to eat, I really wanted to wear something with an elasticated waist. And the scoop on the back of this shirt is great for bum coverage. So the outfit worked well for me....I could eat a lot without getting uncomfortable, whilst keeping my bum covered at the same time. It was a win win. Oh, and for info purposes, I'm wearing an XS. 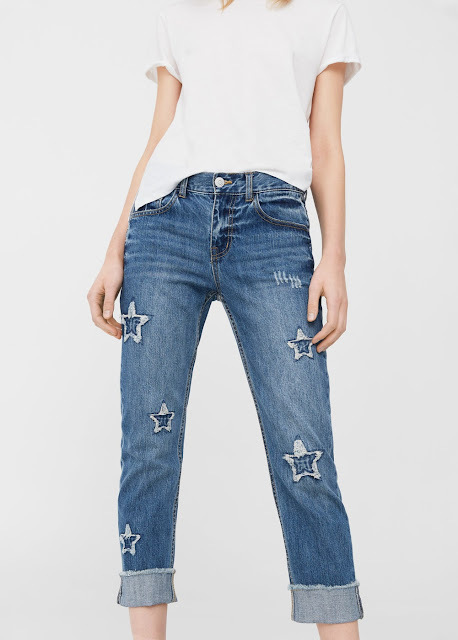 Anyway, here are the Mango jeans (£49.99) which I really like, as I've already mentioned, for the stars but also because they're aren't any rips for saggy bits to fall out of! :( I find that they come up true to size and mine are a size 8. They feel a bit "low in the crotch" for want of a better phrase, when they first go on but when they warm up, they can be hoiked up a bit more so they are more comfortable. And finally, I've barely taken this star necklace from Gift pop boutique (£30) off since it was gifted to me a couple of weeks ago now. 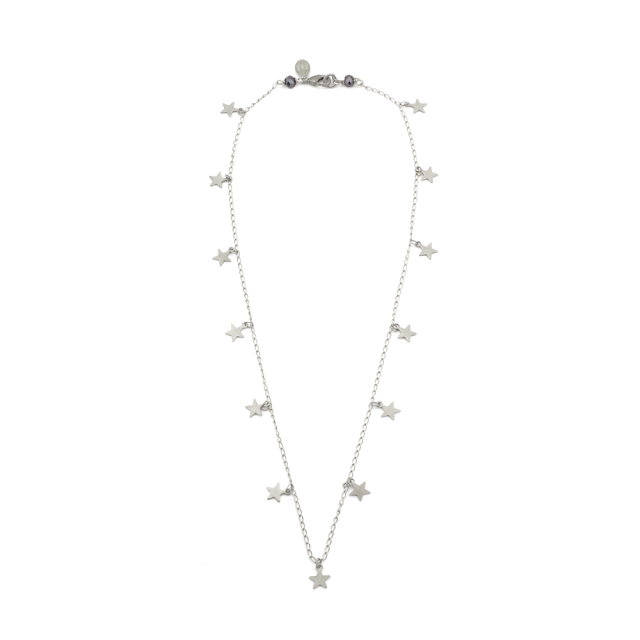 I love that the stars are all the way around the necklace so you constantly get a glimpse of a little shiny star. Apologies to those of you who don't live locally but I just wanted to let you all know about an upcoming event that I'm involved in. And of course if you don't live locally, I would love you to come and give Birmingham a visit! May is always a really busy time for me and I have two events coming up but this is the first one in the diary. 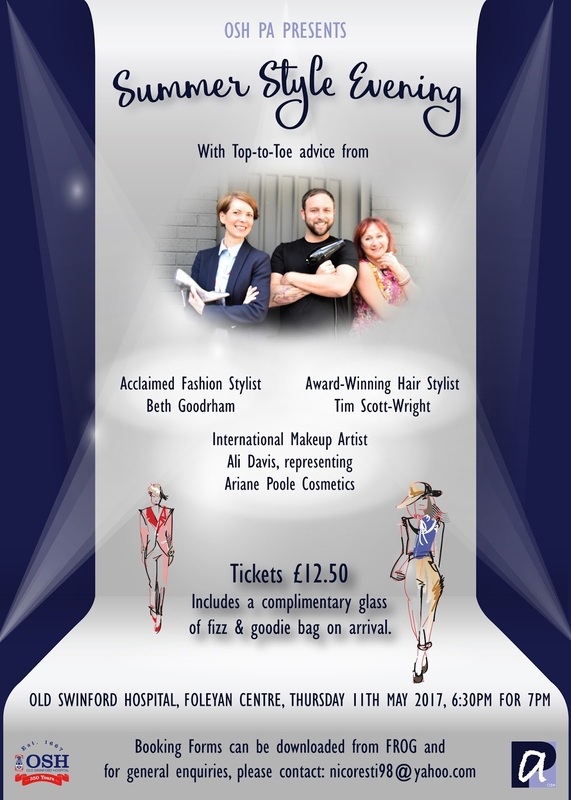 The Parent's Association at Old Swinford Hospital School have kindly invited me back to style and present their Summer Style Evening. We have four lovely (and very brave!) models who work at the school, variously as Matrons and in Communications. I will be styling different looks for the summer months - some trend led, some everyday looks, some for a break away and some for a smarter event. Tickets go on sale on 24th April and must be bought in advance. Sadly we are limited to 150 tickets so if you would like to come along, don't delay as last year we sold out and had to turn people away. It would be great if any of you wanted come along. Support from blog readers is always very, very, welcome! I've had a lot of people ask me recently about my exercise journey and what I do on a daily basis. I'm always slightly nervous of such posts because there's a risk of coming across either as smug or patronising (or both) and I don't want to be either. However so many people have asked me to do a post that I thought that I would at least give it a shot. Oh and apologies for the lack of pictures. No-one wants to see pics of me leaping around and I'm nervous of getting sued if I use something that's unauthorised. I've always loved sport and exercise but I think that between the ages of 22 and 34 it was all a bit hit and miss. I was probably 39 before I got into running again on a regular basis and it's only the last two years that I've seen a real difference in my shape - and that started when I was 44. So all I would say is that no-one is ever too old to start something new, or to change their habits! In response to the requests that I've had, I've decided to do two posts - a more general one about exercise and then a more specific one about what I actually do during the course of a week. Before we even get on to exercise though, just upping our activity levels is a starting point. The first things to ditch are the lifts and escalators. It's amazing how much of a workout you can give your heart and legs just by going up a few flights of stairs in a shopping centre. And it probably doesn't take any longer either - and time, as we all know, is often the crux of the exercise problem. When it comes to exercise, my first observation is that it definitely helps if you love what you do, whether it's dancing, netball, running, football, tennis, squash, swimming, boxing, Zumba or going to the gym. I think that the only way that anyone keeps motivated or keeps something up, is if it is fun first and exercise second - most of the time. Then it doesn't really feel like you're exercising at all. So working out what you like to do when working out is key. And often going back to what you loved when you were younger is a good starting point. For me, I like to combine seeing my friends with exercising - so basically if I'm chatting I'm happy. Or I like to watch TV (I know, how bad is that?!) Stick me in a British Military Fitness class and you're likely to find me shouting back at the instructor and stomping off - or just refusing to do it. I like to pit myself against myself and I don't like being shouted at. What that says about me I'm not sure - but there we go! Also I don't like the time wasted in driving to a class, sorting myself out, doing a class and driving home. The wasted time makes me really stressed. So I'm not a big fan of classes - but for others they're a godsend. For me, exercise needs to be both time efficient and enjoyable (most of the time) - oh and cost efficient too. Identifying when you are at your best and what your windows of opportunity are, are essential. There are points in the day when the thought of exercise couldn't be further from my mind. I'm hugely admiring of people who are up and out exercising at 5.30am. I just don't think that I could do that. But then again, if it was my only window of opportunity then perhaps I would do it. And then you just have to accept that sometimes exercise is purely functional - it's not necessarily fun, or sociable and it might be uncomfortable and hurt a bit - but the results are worth it and most of those sessions are fairly short lived. Here I'm talking about specific work-outs for abs, or legs, or arms for example. But do a session in front of Broadchurch and it's all fine. Or do hill sprints with some great music and it makes all the difference. Or just do half a session. A bit of "cheating" is better than not doing it at all. And as for HIIT workouts which are uncomfortable and sweaty - well the feeling afterwards always makes them worthwhile and at most they last 25 minutes. And if you just can't face it, or feel the need to give up, don't beat yourself up about it. Some days your body and mind just don't work as they should and so it's better to have a rest and try again another day. But I think that my main advice would be to be kind to yourself and to up your activity or exercise levels slowly. If you chuck yourself into something head first and hate it, it will be demoralising and act as a dis-incentive to keep going. So (power) walk before you run, or do a couch to 5k app, or start with a beginners class, or do it with friends and set realistic, achievable goals for yourself. Or don't set any goals at all to start with and just see how you feel.